CCSU Result : Choudhary Charan Singh University , Meerut - Results 2019 . Get Latest Updates for CCSU Exam Result Information of Various Course of Graduation , Post Graduation . Choudhary Charan Singh University Offered Various Categories of Courses . Now, there are five faculties with 22 UGC sponsored and 35 selffinanced/job oriented courses being run in the campus. 252 professional colleges/institutions 109 colleges and one constituent college are affiliated to Chaudhary Charan Singh University. CCS University Meerut has many degree colleges affiliated to it. They fall in two divisions: Meerut and Saharanpur with nine districts including Bagpat, Bulandshahr, Gautam Budh Nagar, Ghaziabad, Hapur, Meerut, Muzaffarnagar, Saharanpur and Shamli. 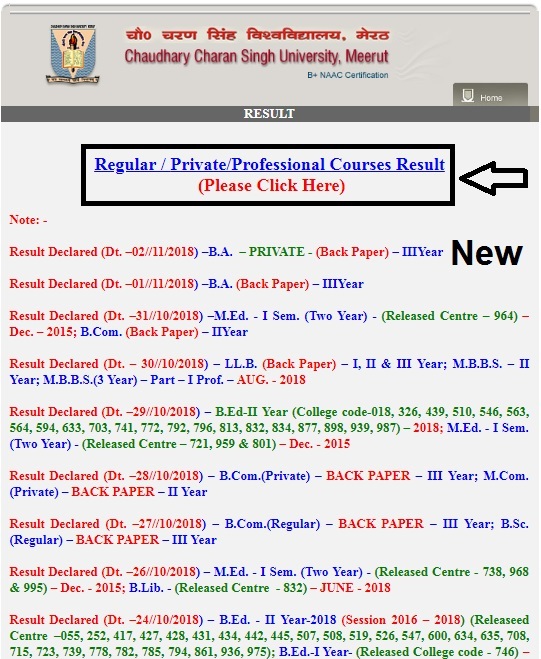 Get Latest Updates of CCS University Exam Results 2019 , Find Latest Result Information of Choudhary Charan Singh University of Various Graduation and Post Graduation Courses Like B.A. (Regular) , B.A. (Private) , B.Com. , B.B.A. , B.C.A. , B.Sc. , B.Tech ,M.B.B.S, M.A. (Regular) , M.A. (Private) , M.Com. , MBA , MCA , M.Sc, M.Tech , M.D. , M.Phil , PHD Etc. Go To CCSU Official Website https://www.ccsuniversity.ac.in/ . Home Page will open on your Computer Screen..
Now Select Course from List Which You Want To Check Result , Select Year / Semester of Your Course , Insert Your Roll Number and Then Click on Submit Button . Your Result will Display on Your Computer Screen . You Can Print or Download Results . 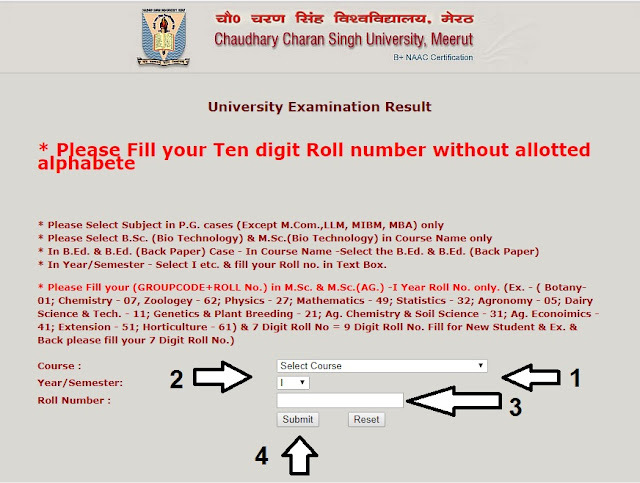 So With these simple steps you can Check your CCSU Results .